Who is looking out for the frogs, turtles, songbirds and other critters on Sauvie Island? We are! This isn’t a membership organization, so there are no dues to pay or donations to be solicited. But if you want to get involved, volunteer or just be kept informed, send a note and your email address to sauviehabitats@gmail.com, and we’ll let you know when things are happening. 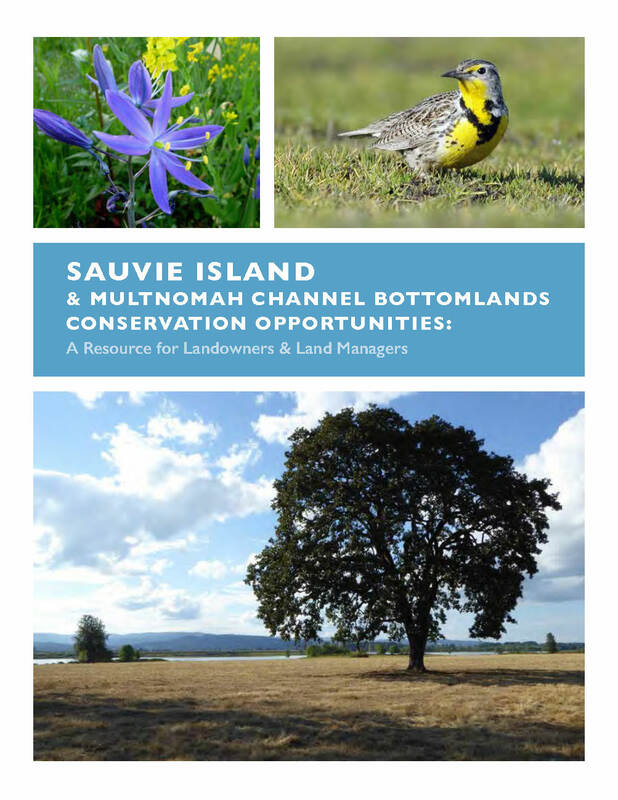 The Sauvie Island/Multnomah Channel Conservation Resource Guide has 100+ pages of information on plants, animals, habitats, soil, hydrology, etc. and many ideas for improving habitats and conditions for wildlife on the island and in the Multnomah Channel Bottomlands. It was a joint project of the Sauvie Island Habitat Partnership, the West Multnomah Conservation District, the Scappoose Bay Watershed Council. Download here: Resource Guide pdf. 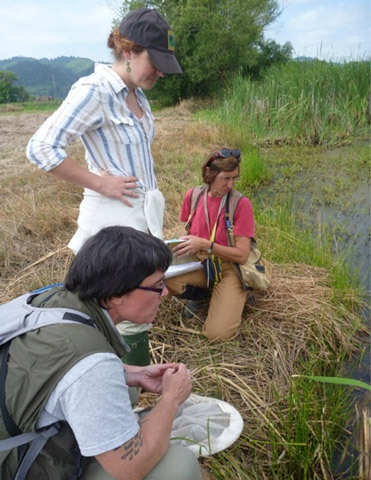 Experts discuss how to create dragonfly habitat on Sauvie ponds. 10 ponds on private land have been targeted for habitat restoration by SIHAB. Turtle, amphibian egg mass and aquatic invertebrate surveys have been done on each pond, as well as assessment of current aquatic, riparian and upland plants. A team of technical experts visited each of the ponds in summer 2013 and made recommendations on how to improve the habitat for a variety of species. We’ll be implementating the recommendations over the next few years. Partners: WMSWCD, ODFW, OSU Sea Grant, Xerces Society, NRCS, Sauvie Island Academy., Private landowners. Meadow wildflowers are being propagated by SIHAB for grassland restoration on three sites on Oregon State Parks and ODFW land on the island. Some planting was done in Spring 2012 and a larger planting was done in Fall 2013. At this point, we are experimenting with small plots to see which plants thrive with minimal care. 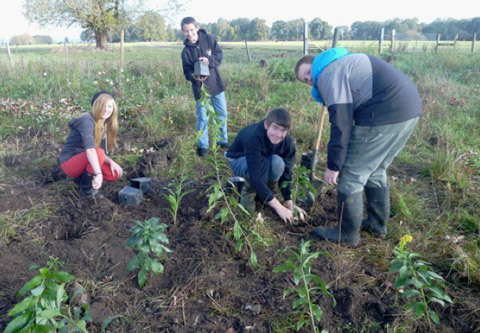 Students from Sauvie Island Academy assisted with planting and will be monitoring to see how plants hold up to cattle and goose grazing and management practices. Partners: Oregon State Parks, Oregon Department of Fish and Wildlife, Scappoose Bay Watershed Council and Sauvie Island Academy. Ospreys have made a great comeback on Sauvie. As they run out of ideal nesting sites, some built have attemped to build nests on power poles. This isn’t good for them, since they can get electrocuted, or for PGE and Sauvie Residents, since it can cause power outages. In summer 2012, SIHAB GPS’ed and monitored osprey nests on parts of the island that have power poles to see at what intervals ospreys were nesting. We then helped secure landowner permission so that PGE could erect five new nesting platforms in appropriate locations. Monitoring will continue in subsequent years. Partners: PGE, Audubon Society of Portland and ODFW. West Multnomah Conservation District supplied funds to build 11 turtle basking for Sauvie ponds and canals. Western painted turtles live in the canals, ponds and lakes on the island. SIHAB conducted turtle surveys on non-ODFW lands on the island in 2102 with a grant from WMSWCD and the help of numerous volunteers. ODFW lands were not included in this project since they had been previously surveyed. In summer 2013, SIHAB constructed and placed 11 turtle basking rafts around the island. Partners: WMSCD and Sauvie Island Drainage Improvement Co. WMSWCD provided funding. Sauvie Island has been a “stomping ground” for botanists since the 1800s, and is well represented in Oregon herbariums. Using these records, as well as lists developed by credentialed botanists for ODFW and Oregon State Parks lands, SIHAB is assembling a list of plants that historically and currently occur/red on the island. The list can be used by agencies, private contractors and landowners involved in habitat restoration. 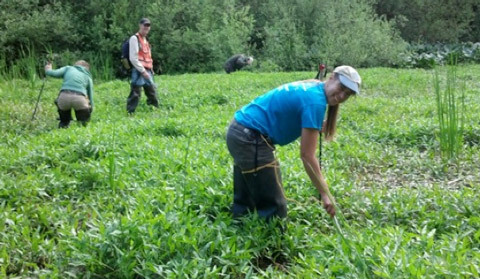 Volunteer botanists from the Native Plant Society of Oregon pulled on waders and searched Sauvie ponds and wetlands for rare aquatic plants. This started as a search on the island for Howellia aquatilis, a federally-listed aquatic plant that was new to the botanical world when noted botanist Thomas Howell discovered it in his Sauvie pond in 1879. We didn’t find Howellia, but we did find a number of other rare species, and we now have a much better idea of what plants inhabit water bodies on all parts of the island. Partners: Native Plant Society of Oregon Rare Plant Watch Team, NRCS and Scappoose Bay Watershed Council. The Sauvie Island Drainage Improvement Company has easements along the island’s drainage/irrigation canals, and has traditionally asked that these be kept free of trees and shrubs to facilitate routine maintenance and dredging. SIHAB and the West Multnomah Conservation District have done three experimental plantings with several test plots to show alternative possibilities for wildlife corridor plantings that could make the canals better habitat for a variety of species. Partners: WMSWCD, Sauvie Island Drainage Improvement Company, NRCS, ODA. Funding from WMSWCD. 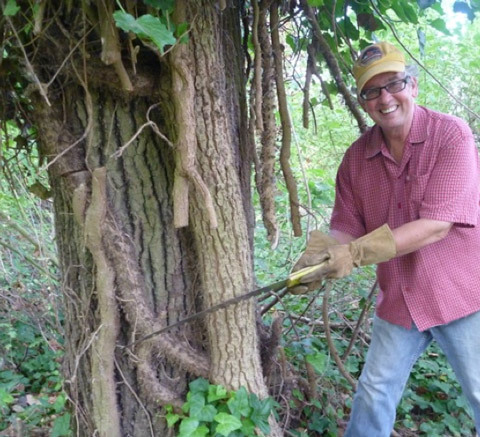 The 2-acre forest next to and belonging to the Sauvies Island Grange was so infested with ivy that grange members were considering clear-cutting as a solution. 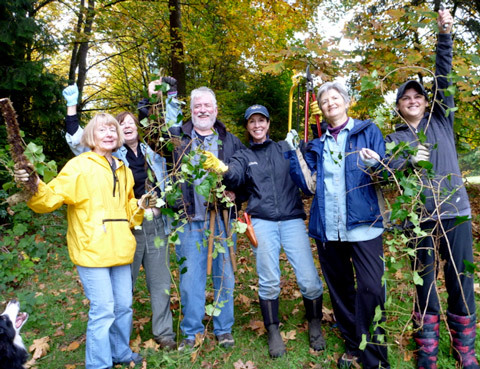 In January, 2011 SIHAB organized volunteers and began ivy removal. A grant from WMSWCD provided funds for spraying of some areas of ground ivy, once volunteers had killed tree ivy and removed most of the ground ivy. 48 volunteers provided nearly 500 volunteer hours on this project. We planted a few native plants, but were mostly astonished by the resiliency of the native plants, which must have been lying in wait for decades for the opportunity to make a comeback. We continue to monitor the forest and remove re-sprouting ivy. Partners: WMSWCD, Sauvies Island Grange, SOLV. One of the largest ivy vines we’ve seen on the island prepares to die at the hands of a SIHAB volunteer. 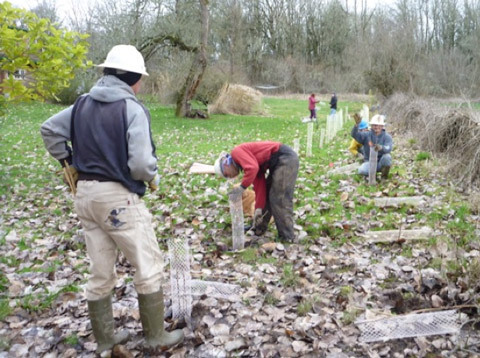 A crew plants native shrubs and small trees as part of the Sauvie Hedgerow Project. Hedgerows of native shrubs and small trees were planted on 12 private properties on the island to provide habitat for pollinators, songbirds and other species. A grant from WMSWCD FISH program provided funds for plants and crews to plant them. Landowners matched grant funds with hours spent on weeding and watering plants. Much of the wildlife habitat on the island is in the hands of private landowners, and many landowners are interested and enthusiastic about enhancing habitat for songbirds, turtles, frogs and other species. SIHAB writes articles on native and invasive plants and animals and habitat restoration for the Sauvie Island Newslinks and has given presentations at Sauvie Island Community Association and Sauvies Island Grange meetings. An evening class on Sauvie Island Native Plants was offered in July 2013. Seek grants and other funding for priority project. The partners recognize the importance of agricultural resources on the Island and are not advocating for conversion of farmland to habitat. The organization is not involved in political advocacy.